As part of several improvement projects to the City of Kalamunda Town Centre, Douglas Partners was engaged to provide geotechnical advice for the installation of a 400 m long section of proposed stormwater drainage pipes and associated manholes. 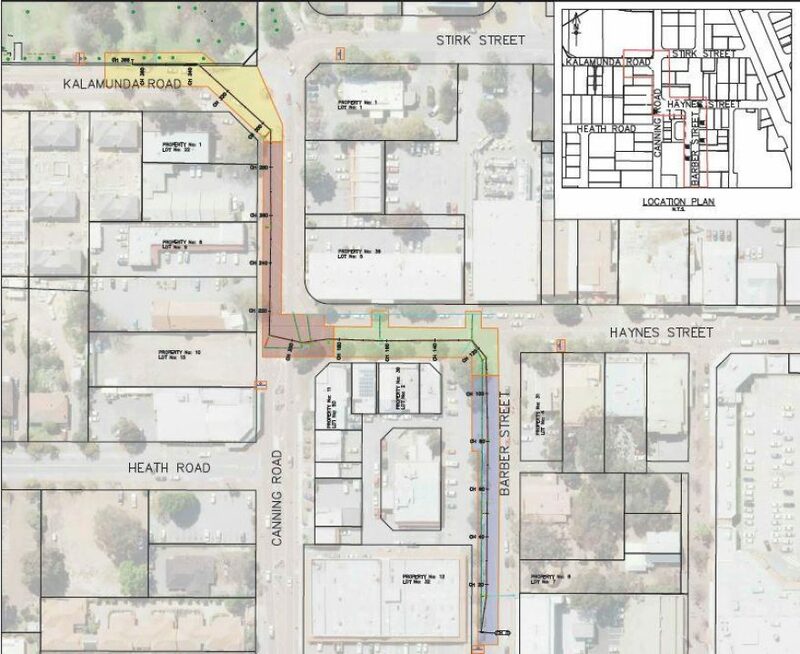 The 400 m long alignment of proposed stormwater drainage pipes was divided into four sections along Kalamunda Road, Canning Road, Haynes Street and Barber Street. Some of these roads form main commuting routes towards Perth. Douglas Partners geotechnical specialists were engaged to undertake an investigation which included the drilling of thirteen diamond core boreholes. The collected field data was used to assess the presence or otherwise of any hard ground conditions, including possible high strength iron cemented laterite and granitic bedrock, over the proposed excavation depths and to provide advice on suitable excavation equipment and respective excavation rates. The identification of hard ground conditions together with minimising disruption to the surrounding community during the field investigation were understood from the Shire of Kalamunda to be two critical requirements for the geotechnical investigation, to ultimately minimise risks of claims from prospective earthworks contractors and complaints from residents. Because the location of the proposed alignment within existing roads, high volume of daily traffic on these roads and the presence of several adjacent commercial buildings, the field investigation was undertaken during approved night periods. Test locations were carefully selected and a Noise Management Plan was prepared for the Shire of Kalamunda’s approval, and in particular included commencing the investigation at test locations in the vicinity of existing residences and progressing away, in order to minimise disruption to the surrounding community. In particular, Douglas Partners provided advice on the impact of shock induced vibrations during rock excavation, on nearby buildings and associated provisions to minimise the abovementioned vibrations. Douglas Partners worked closely with the Shire of Kalamunda to ensure that the investigation would provide a reasonable coverage of the proposed alignment whilst meeting the main objectives of the investigation, i.e. the identification of hard ground conditions with minimal disruption to the surrounding community.